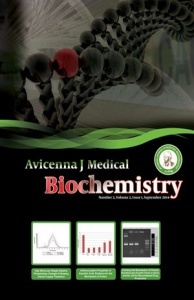 Avicenna Journal of Medical Biochemistry (AviJMB) is the official journal of the Hamadan University of Medical Sciences. The objective of this journal is to publish novel information leading to a better understanding of biological mechanisms of human diseases, their prevention, diagnosis, and treatment. Papers concerned with normal metabolic processes or with constituents of normal cells or reports of experimental or clinical studies in animals which are relevant to human disease are also welcomed.